Rachel Nall began writing in 2003. She is a former managing editor for custom health publications, including physician journals. She has written for The Associated Press and "Jezebel," "Charleston," "Chatter" and "Reach" magazines. Nall is currently pursuing her Bachelor of Science in Nursing at the University of Tennessee. Throughout the ages, saunas and steam baths have been used as a means to soothe weak or tired muscles, encourage the release of toxins through sweat, and clear the sinuses in order to facilitate easier breathing. Because sauna temperatures can reach in excess of 100 degrees F (which can alter heart rate and cause dehydration or heat stroke), it’s important to properly and carefully use a sauna in order to experience its positive benefits. Consume 8 oz. of water or more before going into a sauna. Because your body loses water through sweat while in a sauna, this will help to restore moisture to the body. Wear clothing that is very lightweight and nonrestrictive. Clothing materials that “breathe,” such as those that contain natural fibers such as cotton, are the best options, as they do not lock in heat and help to absorb the body’s sweat. 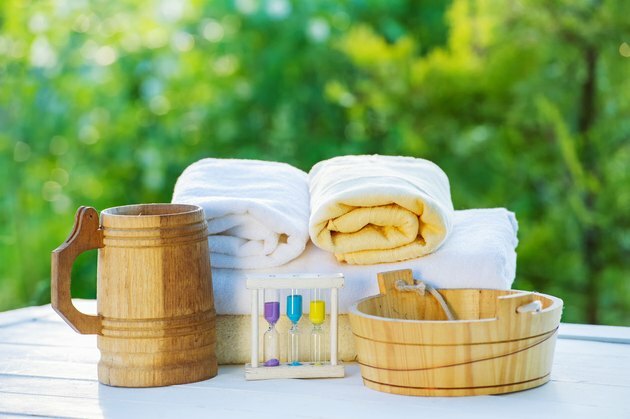 Bring a towel with you to the sauna to provide a soft area on which to sit or as a moisture absorber for any sweat. Stay in the sauna for only 15 minutes if you have not used a sauna before or are not feeling well—for example, if you have an infection, cold or flu. Using a sauna for longer under these circumstances can result in heat stroke or loss of consciousness. If you have regularly utilized saunas, do not stay in for longer than an hour. If you notice you are feeling weak or suddenly fatigued, exit the sauna immediately. Wait several minutes before entering a cool shower or pool, or exposing yourself to cool outside air. This dramatic change in temperature following a sauna can place excess stress on your heart and cause your blood pressure to rise too quickly. Drink more water (at least 8 oz.) following using a sauna in order to continue to replace lost water. Always wear a pair of sandals in your sauna, as this prevents you from coming into contact with germs that can linger at some health clubs, gyms or other public facilities. Never use a sauna after you have been drinking alcohol or taking sedatives, as either behavior can lead to severe dehydration, dizziness and loss of consciousness. The same goes for after eating a heavy meal, as the sauna can interfere with digestion. Remove all jewelry prior to entering a sauna, as some temperatures can heat the jewelry to the point that it can burn the skin. Does Sitting in a Sauna Help You Lose Weight? How Many Calories are Burned in a Steam Sauna? Can You Lose 10 pounds in a Sauna? Is It Unhealthy to Use a Sauna After a Workout?